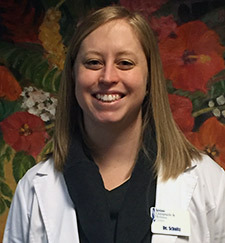 Dr. Nichole Schultz first fell in love with the Milwaukee area while obtaining her undergraduate degree in biomedical science from Marquette University. She then moved on to receive her Doctor of Chiropractic degree from Palmer College of Chiropractic in Davenport, Iowa. Dr. Schultz always knew she wanted to go into the medical field, but she was unsure which field. She had been receiving chiropractic care since she was a teenager for her severe headaches. She understood how good the adjustments made her feel without the need for medication. This, then, lead her to take head and neck classes in her undergraduate to better understand the brain and nervous system. It was after this class she decided to pursue chiropractic. When not caring for patients, Dr. Schultz enjoys exercising, swimming, and crafting. She and her husband are avid Marquette basketball fans and enjoy going to movies.